Under the canopy of the trees in Newlands Forest, Cape Town, hides a stone cottage and garrison called “Paradise” once owned by a woodcutter and his family, and then Lady Anne Barnard late in the 18th century. The cottage was built by the Dutch East India Trading Company and is surrounded by other stone military garrisons. Unfortunately the houses are all but dilapidated and only a few of the stone walls remain almost hidden by centuries of plant overgrowth. 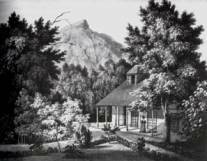 The cottage was owned by a woodcutter who would look after the timber from the Table Mountain reserve. After his occupancy, new tenants moved in, primarily Lady Anne Barnard who the cottage is named after. Now, Lady Anne Barnard was born ‘Anne Lindsay’ in Scotland in 1750 to a well to do family, and was an accomplished writer, painter and socialite. She married Andrew Barnard who received a post as colonial secretary in the Cape of Good Hope, and there they travelled in 1797. The husband and wife only stayed at the Cape for five years, but during her time there, Lady Anne wrote a number of entries into her diary about the people, the culture and social life of the time – these entries have been a great source of information for historians, which is likely why the cottage in Newlands is known as Lady Anne Barnard’s Cottage. They also had another home in Newlands, which is now part of the Vineyard Hotel. She was most well known for writing the classic Scottish poem Auld Robin Gray. Lady Anne died in 1825, but she is commemorated at a few places around Cape Town including a carved sculpture of her in the suburb of Claremont. Well, the ruins of “Paradise” are unfortunately not much to see anymore, but it’s still worth a visit if you’re in the area, plus the forest is a beautiful place to be. ← Are camels proving the Bible to be historically inaccurate?